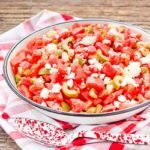 Olive Tomato Salad is wonderful for summer entertaining. Tomatoes, olives, cucumber, feta cheese, and shallot are tossed with an oil and vinegar dressing. Place tomatoes, olives, cucumber, feta cheese, shallot, and capers in a large bowl. Toss to combine. Whisk together olive oil, vinegar, garlic, and paprika in a small bowl. Serve immediately or chill until serving. If chilling, allow salad to come to room temperature and toss again prior to serving.